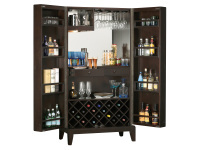 38" x 21" x 72.5"
This Hide-A-Bar Cabinet Stores Up to 22 Wine Bottles, and Provides a Generous Amount Of Room For Liquor Storage. Auto-On Light Switch Turns The Light On As The Left Cabinet Door Is Opened, and Off When Closed. 18? Door Hinges. 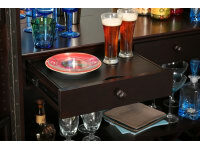 Full-Length Piano Hinge Allows Doors to Open Wide For Easy Access to Storage. (W x D x H): 38" x 21" x 72.5"